AOBO Snet 2012 - HANGZHOU AOBO TELECOM.,LTD. Snet 2012 series of serial port Ethernet servers are a type of industrial and multi-functional serial to Ethernet equipment developed by Hangzhou AOBO Telecom Co., Ltd. and integrate the TCP/IP protocols internally. The products are used for the data transmission between the serial port and Ethernet and add the Ethernet interface for the serial port equipment conveniently. It can be used for the remote communication between the serial port device and PC machine or between several serial port devices. Snet 2012 series of serial port Ethernet server equipment offers the industrial level product with the wide temperature range and is capable of the operation under the temperature of -40℃~85℃. 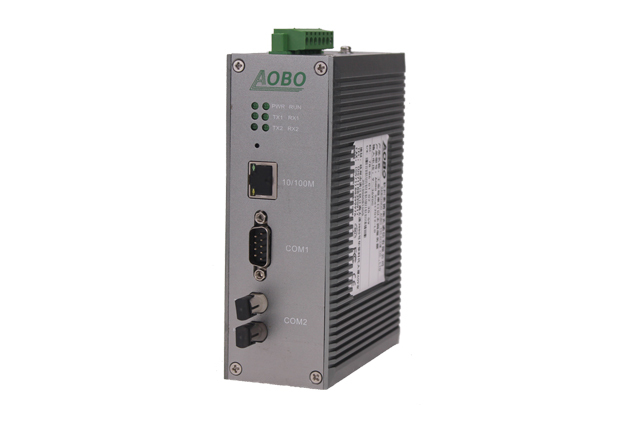 It has the 10M/100M self-adaptation Ethernet interface and the maximum Baud rate of the serial port communication is 115.2Kbps. It supports the multi-connection, allows the simultaneous management of a embedded module equipment by no more than 4 users and offers several working modes, such as TCP Server, TCP Client, UDP and Real COM. Furthermore, the remote configuration method is also supported to facilitate the users to set relevant configuration parameters flexibly and conveniently. √ Provide 1-4 serial ports RS232, RS 485 or RS422 for the selection. The Baud rate can be configured arbitrarily within the range of 300bps~115.2Kbps. It operates by means of the separation, with the maximum isolation voltage being 2.5KV. √ Several working modes, such as TCP Server, TCP Client, UDP and Real COM driver, are available for the working methods. Working port, target IP address and port can be configured. √ After the network breaks, it is disconnected automatically to ensure that the whole network builds TCP connection reliably. √ Support the working method of the virtual serial port to enable the user’s serial port equipment to update to the Internet communication method in a seamless manner, without the need to modify the original serial port software. √ TCP supports the multi-connection, connection of check password and transmission of the particular data after the connection and allows at most 4 users to manage a embedded module equipment at the same time. 1 RS232 Serial data electrical interface，1 The string data type optical fiber interface（double transverse/double fiber/850nm/ST_1KM），Designed for the fan master Mita3100 development.